« Oh, My, God. Shoes. 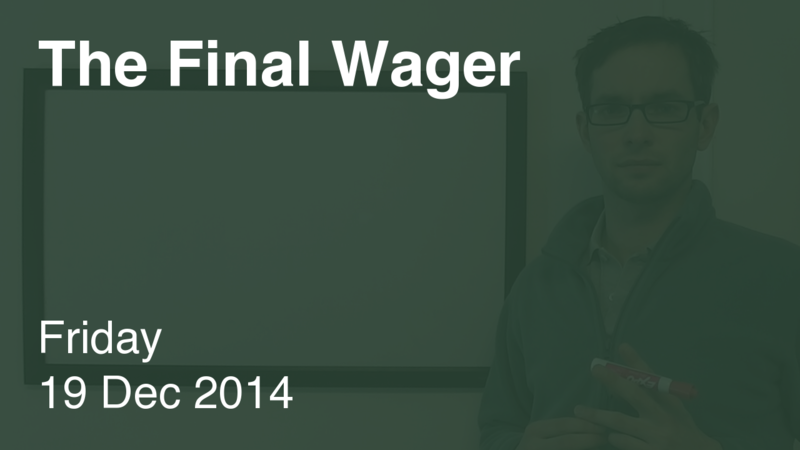 It’s Friday, and I’m happy with our Final Wagers – yet, I’m still moderately displeased. There’s a pretty boneheaded math error in the video. Ten points if you can find it. 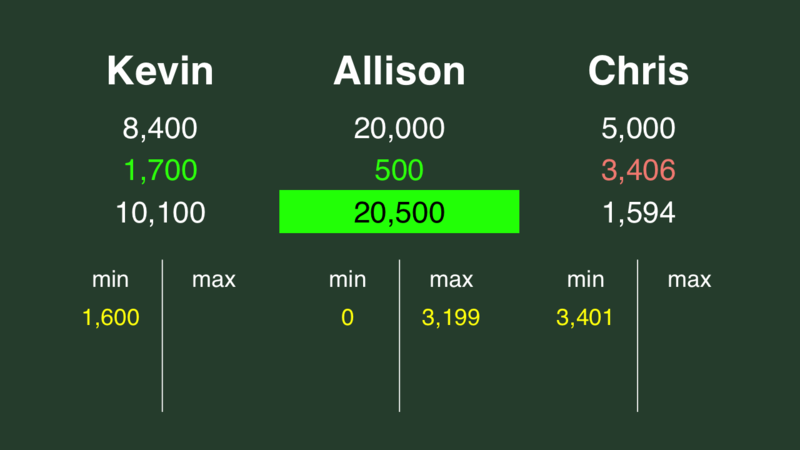 To keep Kevin locked out, Allison can wager up to 3,200. A successful doubling will put Chris at 10,000. To cover this, Kevin should wager 1,600. Chris needs to wager at least 3,401 to force Kevin to respond correctly. Now let’s switch over to The Penultimate Wager. Allison had a commanding lead and one clue remaining on the board. I’m have no idea why no one went hunting once we were down to the last category; go for the gusto, people! I highly doubted we’d get to that last $2,000 clue, and if there had been any room for error, Allison could have eliminated it by stalling with the wager and the response (she did a good job on both). Third place is only in contention if his score is greater than first minus second. Another way to say this is first must have more than second plus third to keep third out of it. 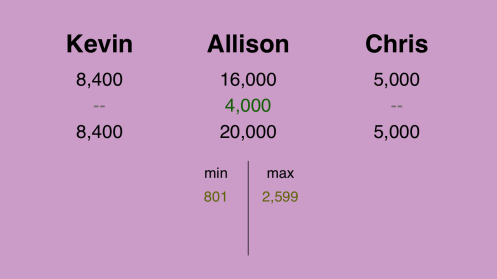 8,400 + 5,000 = 13,400, so Allison should cap her wager at 2,599. A “crush” is when second place has more than 1/2 but less than 2/3 of first’s total. In this situation, with proper wagering, the only way first can lose is if he misses and second gets it right. The cut-off point for a crush is also the 2/3 break point. To calculate what amount Allison can have to keep the crush in place, multiply Kevin’s score by 3/2 – to do this, you can add half of his score to his present total. That’s less than the total Allison needs against Chris, so 2,599 remains the cap. Allison wagered too much. Even if she thinks we will get to that final clue, tack on the extra 801 to make it a lock no matter what happens with that $2,000 answer. But she has the cash! And good for her. What are (one of) Cyprus, Ireland, and Malta?